Chiappa Firearms harnesses the fun and functionality of the legendary AK rifle in the form of two easy to shoot 9mm and .22lr carbines, the RAK-9 and RAK-22. These have the look and feel of the original but use more readily available and easier to shoot ammunitions. The RAKs are made from steel with exceptional fit and finish. 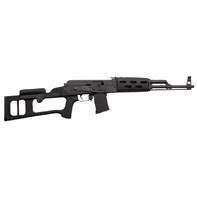 They feature a 17.25" barrel, use standard AK furniture and come with two 10 round magazines.